I’ve been making a lot of rice soups likes these recently, partly because of the weather and partly because they’re so super easy! Having no time to cook for yourself is a familiar feeling for many, especially around this time of year. But while I have little time at the moment, I still want to eat healthy delicious foods, feel nourished, healthy and happy. (ha, don’t we all?) Whether you’re catering the Christmas parties or eating at them, with so much going on we need the slow releasing energy and the nutrients supplied by these complex carbs to keep us going and feeling well. Both lentils and brown rice are rich in cholesterol lowering fiber. Lentils also help manage blood sugar levels that can surge after eating, meaning you shouldn’t have highs and slumps in energy. They also have significant amount of antioxidants, b vitamins & folic acid. All good news, together they make a complete protein as well, although with the addition of avocado you will have more than enough. Which incidentally, is great for nourishing winter skin. You can make this soup at any time, keep in the fridge and reheat when you need. It actually makes a really good breakfast, keeping you full all morning, and a chuffed that you ate something so tasty and good for you so early in the day! The chili oil in the recipe requires the most effort, but it’s a great oil to have around and you can add it to anything! So make a double batch, as it will last. The addition of Thai basil and birds eye came as a bit of an accident, as I had some left from our Yoga Feast last week and thought I’d try it and it literally took this soup to another level. 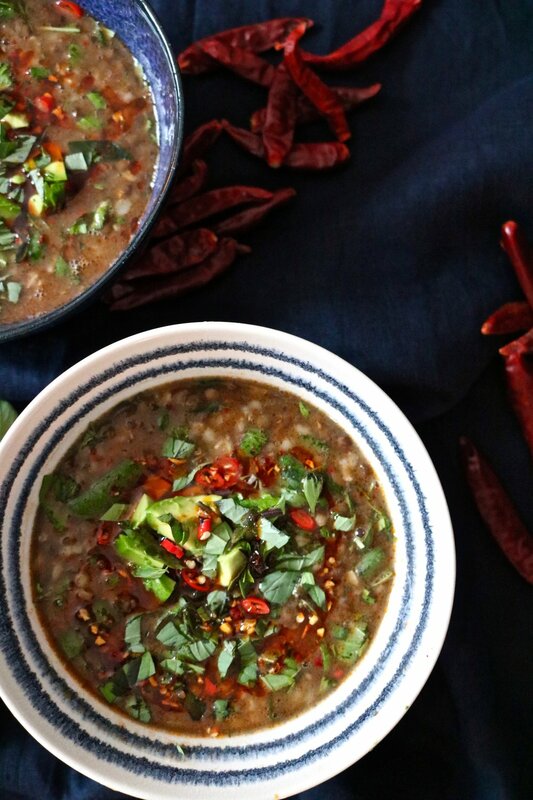 What would be a tasty soup, along with the chili oil turned into an amazing and seriously addictive soup! Avocado I added because I love to add textures and extra bits to soups I make. Much like in Mexican soups where avocado, crunchy tortillas, fresh herbs etc bring what would be a simple soup alive. You could also stir through some spinach for extra vitamins. A little note on our Yoga Foodie Feasts. Last Thursday we had our Yang and Yin Yoga Feast at 42 Acres, and what a lovely night it was! So relaxed, such a friendly group. We had yoga with Emmy, followed by nourishing but exciting food, finishing with a short meditation to ground you in this hectic time of year. Next we’ll be back at Reva Studios on 28th January! I’ll be back, inspired from exploring Sri Lanka, so be ready for some Sri Lanka delights. Book here, and we have a special, £35 until the end of December. Enjoy the soup and stay warm! * Soaked preferably. This makes it easier to digest and will lower cooking time slightly but soaking isn’t essential for cooking rice and lentils as it is for other pulses such as chickpeas. Soak up to overnight. Rinse the rice and lentils and place in a large pan with the water and the bay leaves. Bring the pan to the boil and cook on a low heat with the lid on for about 30-40 minutes until the rice and lentils are tender. While they’re cooking make your chili oil. In a small pan on low heat, add your oil, then the garlic and cook for about 8 minutes until the garlic just begins to turn golden and crisp up. Make sure you don’t take this too far as the garlic will become bitter if it browns. Transfer the garlic & oil to a bowl. Grind the chilies in a spice grinder until you have a rough powder. – you could use chili flakes here but I find grinding your own is fresher, spices can get a little stale sitting in your cupboard too long. Mix the chilli flakes into the garlic oil & season with a pinch of salt. * You should keep the heat on low here as olive oil has a low smoking point, which means it burns easily. Avocado has a very nice flavour and has a very high smoking point so you can turn it up a little but be careful not to burn the garlic. To finish the soup season with salt and pepper. 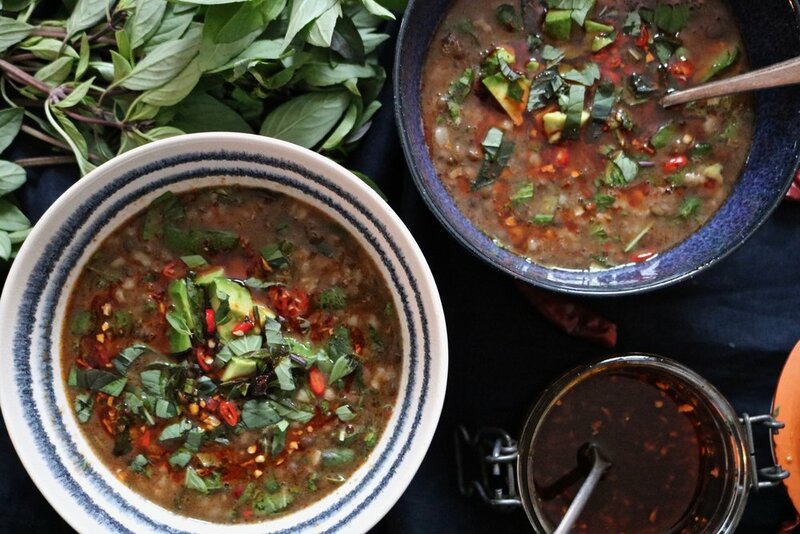 Stir through chopped Thai basil and birds eye chilies, if using and 2 tablespoons of the chili oil. Serve the remaining on the side to add more as desired.